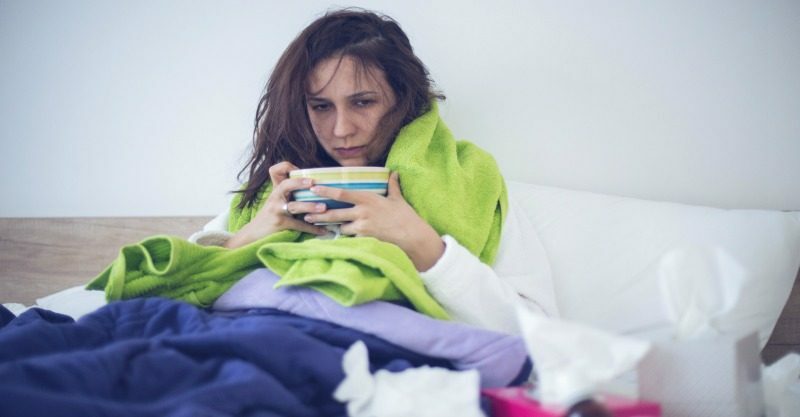 "I was bedridden for a week and my whole family was sick - here's how I coped"
My entire house has had a terrible flu for the last few weeks (and my baby has croup)… a mum’s worst nightmare. To make matters worse I also suffered a bad head injury after fainting and was bedridden for an entire week. Hell on toast? Yes it was. Here’s how I coped. This particular flu was EPIC (and it’s still yet to completely f### off). Full blown viral influenza and highly contagious. 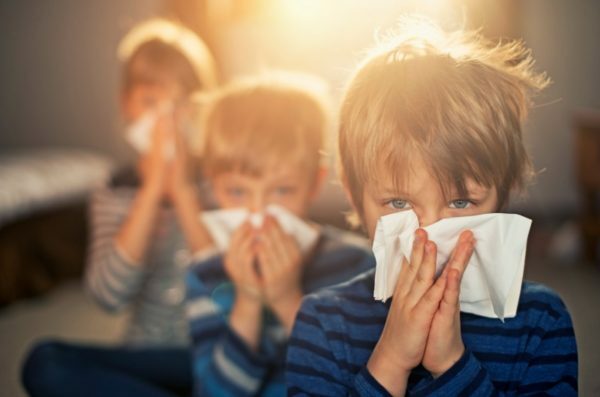 I didn’t want to risk my elderly mother’s health or my sister’s who has a young baby, and with my other sister away on holidays – darn it), there really was no one to help, it was just my husband and I doing it tough, waiting for the flu fog to lift. They were able to drop off some supplies though, which I gratefully accepted – medicines, tissues, drinks and food. So when friends started asking what they could do to help too, I wasn’t shy about asking for the same and as a result there were less trips to the shops required and numerous meals covered. Phew. Normally one to battle on through illness, after I hit my head and the swelling and pain was getting worse, I knew it was time to stop trying to be a hero and call in the big guns. A paramedic came and told me to get to the hospital along with my baby who most likely had croup. So off we went in the car, even though it was past everyone’s bedtime. Luckily we did because I got the pain relief and fluids I needed (overnight stay required) and my baby got important medicine to help him breathe and stop that horrible barking cough. I also made several trips to the doctor over the course of a couple of weeks to check on everyone’s condition and see if there was anything – ANYTHING – we could take to help us. Nope – still viral so only rest prescribed. Great if you’re childless, but almost near impossible with a family. Despite being stuck in bed for a week with my husband struggling on alone, it was still pretty hard for me to get decent rest. Thank the lord for ABC for Kids. We had it on daily for about 12-13 hours straight each time. It was the only way to distract the older two kids (who were on school holidays – fun times) from feeling terrible, or for when they felt okay and WE were feeling terrible. I would never allow this much telly under normal circumstances, but extreme times call for extreme measures. Total. Lifesaver. I’m not a complete control freak but I do like to run a tight ship. When you’re sick though the only thing that matters is trying to get better, especially if you’re a mum because you need to look after everyone else. My husband did an amazing job when I was bedridden, but he was sick himself and could only manage the bare minimum. I just had to ignore the mess absolutely EVERYWHERE in the house and the gigantic piles of laundry. I didn’t care that everyone wore the same pyjamas for days or whatever clothes they had that were remotely clean. I had to admit defeat and call in sick for work for a week, and forget about things like overdue library books and bills that needed to be paid. It could all just wait. I also had to give up breastfeeding my baby because I was too sick to keep at it, plus the painkillers I was taking had codeine in them which isn’t good for babies. I was going to stop nursing soon anyway (he’s almost one), but didn’t think it would be so sudden and not gradual which made me sad (and upset my baby too), but I just had to let it go and understand it was necessary. Good nutrition was another thing that went out the window. If anyone was hungry (which a lot of the time they weren’t – a nice symptom of this nasty flu), they got given whatever we could find in the house they felt like they could keep down. Two minute noodles, Tiny Teddies, ice-cream, baked beans on toast – if people were eating food, ANY food, then I was happy. Some days I felt like the nightmare was never going to end. I just felt so terrible and helpless, and everyone else was so sick in the house too. The older boys were having the school holidays from hell so you know, some mum guilt to add to it all as well. It was hard to stay positive, okay BLOODY HARD, but by focusing on the fact that this ill phase would eventually pass (it had to! ), did make it easier to cope. A positive state of mind can do wonders for your physical well-being, so next time I’ll definitely be remembering to keep the happy vibes up- and to get my flu vaccination early. How do you cope when the whole house is sick?